This 1920s Hancock Park Adobe is inhabited by two avid gardeners, one of whom is an architect and historian. Working together with the clients, we created a place for them to actively enjoy retirement. Drawing from traditional Moorish architecture, we based the design off of a grid that dramatically transforms from front to back yards. In the tradition of Mediterranean gardens, the use of water is carefully though out. An original, uninspired lawn transformed into a terraced garden; the front yard provides a transition from the sidewalk to the residence. Neutral garden walls provide a structure for the California-friendly plants to thrive within, including aloes, westringia and ceanothus. Red plaster covers the courtyard wall and driveway gate, acting as a stunning backdrop for the soft foliage of the front garden. The entry path and stairs are set on a diagonal leading guests into the walled courtyard. Upon entering the enclosed entry garden, the lavish diagonal paving pops out at the viewer. Squares composed of antique terra cotta tile are lined with travertine and mosaic tile. The tranquil sound of the wall fountain emphasizes the preciousness of water. A bold blue wall leads guests into the house. The neutral concrete driveway expresses the diagonal grid through subtle saw cuts. Like many historic homes in the area, the garage is locate in the back of the property; as a result, the back yard is dominated by the necessity of a drivable surface. 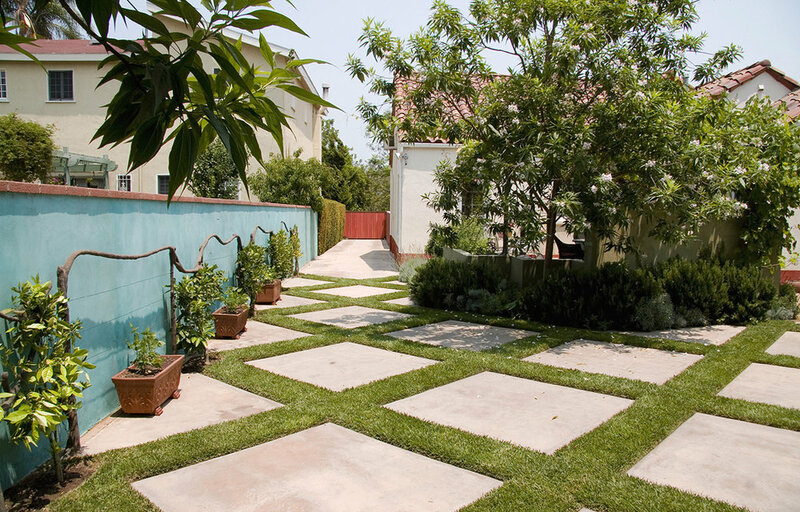 Upon entering this space, the concrete driveway gives way to a dramatic series of squares outlines with lawn. Cooled by the lush grass, the space becomes a place for entertaining and play. Off the back stoop we constructed an intimate shaded patio. A small green wall provides separation from the driveway, while a free-form faux-bois structure supports an overhead vine. 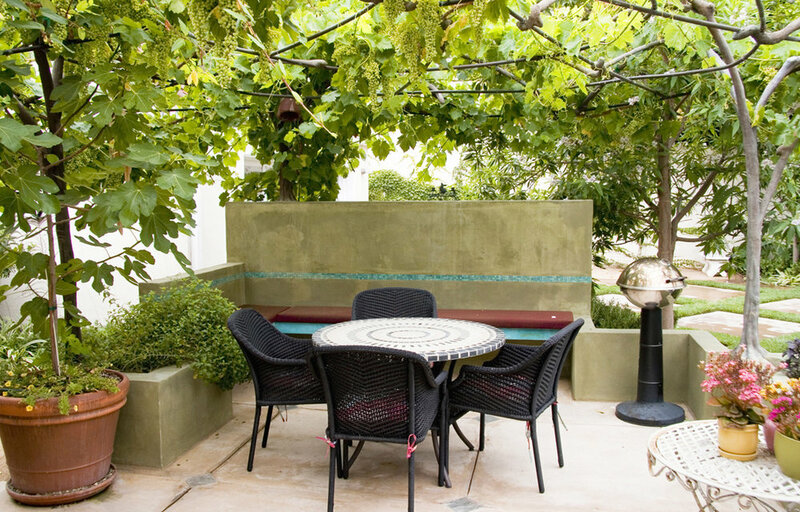 Herb and vegetable beds line the edges, an inspiration for al fresco meals.